Dermot Walsh is vice-president of sales for Ocuco in North America. He took time out of his busy schedule to answer some questions for Envision: seeing beyond magazine. E:SB: Ocuco is new to Canada. 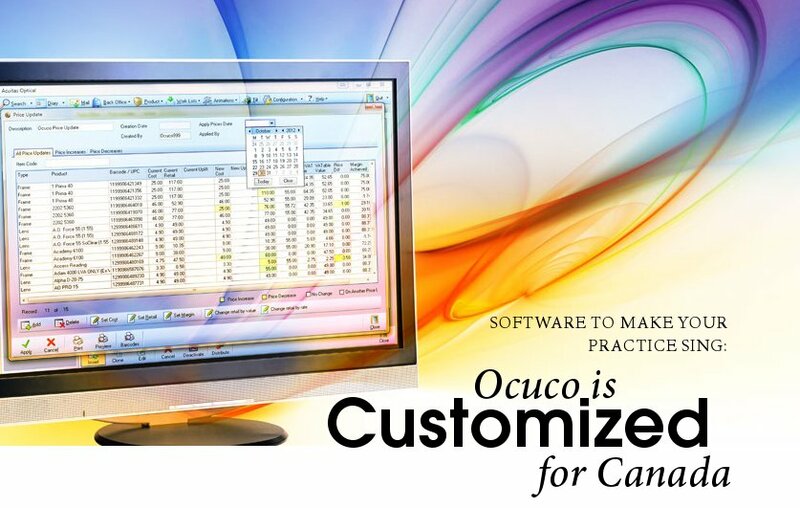 What kind of track record does Ocuco have in the ophthalmic retail software industry? DW: Ocuco is the only ophthalmic retail software company with a global reach. In fact, our software is used in more than 5,000 sites across 36 countries, including the U.K., Italy, France, Spain and Australia. Ocuco has 17 years of solid growth under its belt, with over 100 employees, including 40 developers. E:SB: Is this internationally successful product really applicable to the Canadian market? DW: The company has invested over $20 million in research and development over the last few years with a focus on localizations. Our Patient Relationship Management software, Acuitas, is currently being rolled out in many regions across Canada and will soon cover all health insurance and fiscal rules. E:SB: Which category of eyecare professionals (ECP) is your solution designed for? DW: Acuitas serves independent ECPs as well as multi-branch businesses with two or more practices. Our lab management software, Innovations, is a strong brand in retail workshops and large labs. The integration of Acuitas and Innovations allows one system to complete the full patient journey. E:SB: In 50 words or less, what does Acuitas accomplish in the professional eyecare practice? DW: ECPs with Acuitas will see increased sales, a better-organized practice, and will have a greater understanding of all aspects of their business. Acuitas is the first paperless practice management system with a focus on integration and gathering information in one system for enhanced patient care and empowering the ECP. E:SB: What aspects of Acuitas are most helpful to opticians in terms of keeping the dispensary running smoothly? DW: Opticians can seamlessly manage the entire patient journey, from marketing and appointment booking, through to exam, dispensing, order collection, recall and ecommerce. Acuitas offers many ‘administration savers’, such as two-way SMS communication with patients and electronic submission and reconciliation of insurance claims. E:SB: What are the most impressive gains for optometrists when they use Acuitas? DW: Acuitas allows the optometrist to focus on the patient because all the information is at the practitioner’s fingertips immediately through interfaces with optical equipment, including the Rx, the diagnostics, previous lens and frame selections, and stock availability. Time saved can be better spent with the patient. E:SB: What business development tools does Acuitas offer Canadian ECPs that they didn’t have before? DW: Business Intelligence reports are a key feature of the system and essential to the survival of any business. These include revenues, exam outcomes, sales figures, stock availability, sales and brand performances, recall trends and ROI. With 65 reports in Acuitas, there’s no more guessing about how your business is performing. Implementing a system that follows the patient through the practice means that there is an uninterrupted flow of information when a patient goes from one part of that journey to the next. For example, patients who do not require eyewear to be dispensed can have their exam bill created in the consulting room. Charges for specific exams or imaging are also easily applied to a patient’s account without the need for a verbal handover. E:SB: Is Acuitas easy to learn and to use? What kind of support does Ocuco offer? DW: Acuitas is highly configurable; the software adapts to the way you run your business, rather than the other way around. In a live test before a major buying group, a complete novice learned Acuitas in 15 minutes and then easily demonstrated it to the audience of professionals. The Ocuco support team of 38 is the largest in the global optics industry. Ocuco offers full telephone and online support during typical business hours. All new practices receive a welcome call, hardware review, data migration, assistance in stock setup, onsite training and go-live day support, follow-up advanced on-site training, and dedicated account management and consulting.